Moist to slightly dry woodlands; streambanks, prairie margins. Light to medium shade. Basal and lower stem leaves are palmately divided into 3 leaflets. 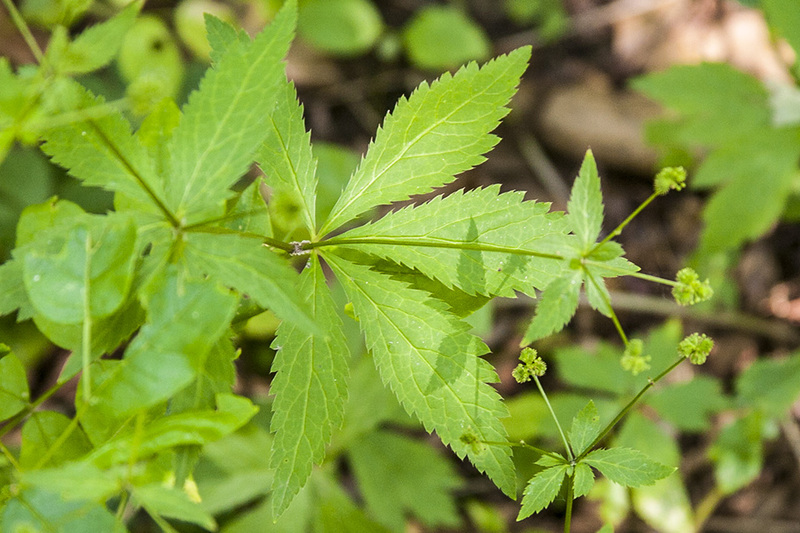 The leaflets of these leaves are less than 3″ long and 1½″ wide. The lateral leaflets are often deeply cut making the leaf appear to have 5 leaflets — “3 looks like 5”. Rarely, there will be 5 leaflets with two deeply cut, looking like 7 leaflets. The flowers are white. There are only 2 to 7 flowers in each flower cluster. All umbellets include both perfect and male flowers. Perfect flowers are stalked. Male flowers are short-stalked and are concealed by the perfect flowers. The sepals are longer than the petals. The styles are inconspicuous, usually shorter than the calyx, rarely as long as the calyx, shorter than the bristles in fruit. The seed capsules are 1 ⁄16″ to 3 ⁄16″long. See the Black Snakeroot Filter for help in identifying this and other black snakeroots. 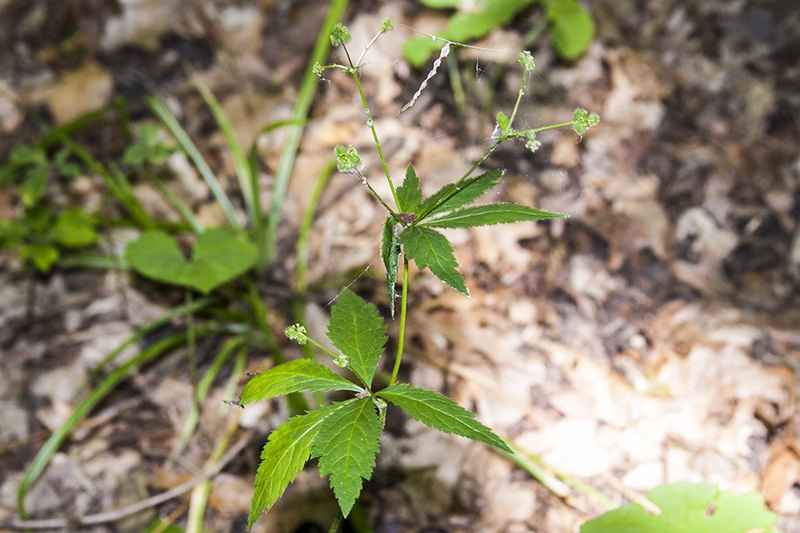 Large-leaved black snakeroot (Sanicula canadensis var. grandis) leaflets of the basal and lower stem leaves are at least 3″ long and at least 1½″ wide. 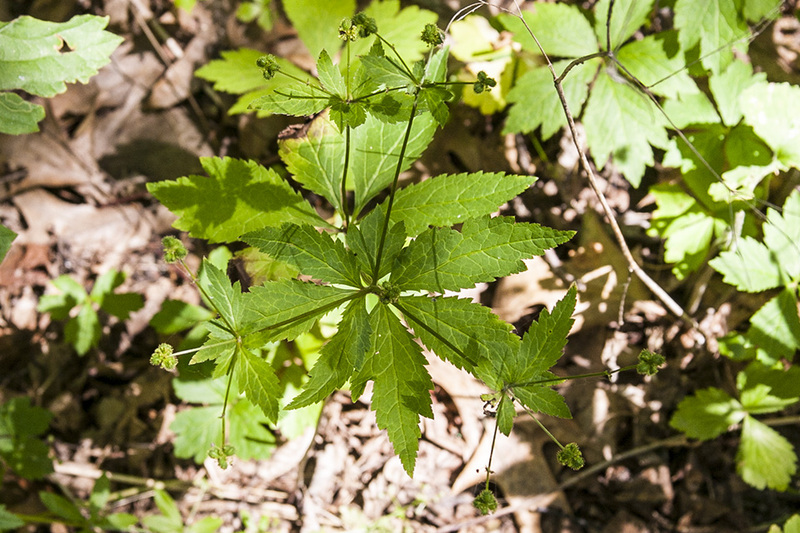 Clustered black snakeroot (Sanicula odorata) basal and lower stem leaves are mostly 5-parted — “5 looks like 5”. The flowers are greenish-yellow. Some flower clusters have 3 perfect (containing both male and female parts) and 12 to 25 male flowers, others have all male flowers. The sepals are much shorter than the petals. The styles are conspicuous, much longer than the bristles. Large-fruited black snakeroot (Sanicula trifoliata) is much less common. Male flowers are long-stalked, rising above the perfect flowers. The styles are inconspicuous, shorter than the bristles. The seed capsules are ¼″ to 5 ⁄16″ long. The sepals in fruit converge, forming a beak as long or longer than the bristles. 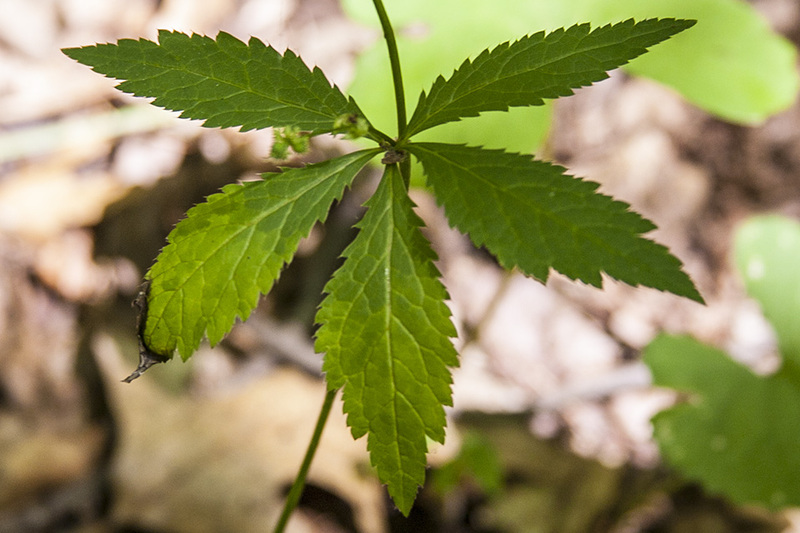 Maryland black snakeroot (Sanicula marilandica) basal and lower stem leaves are 5-parted with two deeply cut — “5 looks like 7”. The flowers are greenish-white. Some flower clusters have 3 perfect (containing both male and female parts) and 12 to 25 male flowers, others have all male flowers. Perfect flowers are stalkless. Male flowers are long-stalked, rising above the perfect flowers. The sepals are as long or only nearly as long as the petals. Sources: 4, 7, 29, 30. The number of leaflets on the basal and lower stem leaves of black snakeroots (Sanicula spp.) is an important identifying feature. However, the lateral leaflets are often deeply lobed, often to the base, appearing to be two separate leaflets. Referring to a flower that has both male and female reproductive organs. Part of the pistil, usually a slender stalk, connecting the ovary to the stigma(s).